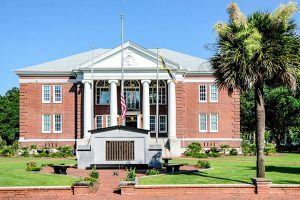 Encompassing an entire city block along Dillon‘s West Main Street, the Dillon County Courthouse stands tall above the downtown historic district. 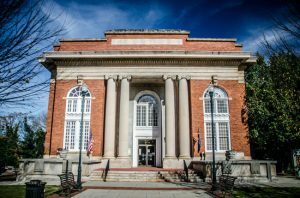 This monumental Neoclassical stone and masonry structure was built in 1911 and is one of nine South Carolina courthouses designed by noted 20th century architect William Augustus Edwards. The courthouse features a central portion with flanking wings. The building has a cross-axis plan, meaning that central hallways are accessed through an entrance on each of the structure’s four exterior walls with each hallway meeting in the center, on the interior. The courtroom and judges chambers are located on the second floor. 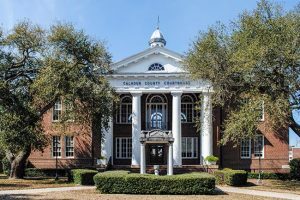 Dillon County Courthouse is the first and only courthouse to serve Dillon County, which was formed by an act of the state legislature 5 February 1910 from the upper portion of Marion County. 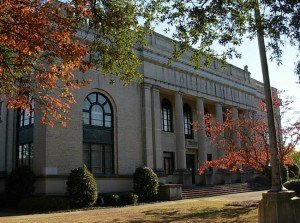 The courthouse was built in 1911. William Augustus Edwards, A.I.A., was the architect; J.A. Jones was the contractor. 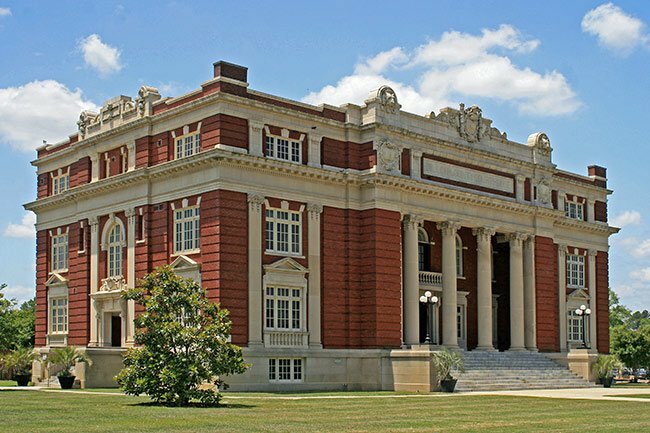 The courthouse is a monumental brick and stone Neo-Classical building with a central colossal Ionic portico in antis and two flanking wings. The composition of the building reflects its cross-axis plan, with central, axial entrances on all four elevations, and the offices in the four quandrants defined by the two axial halls. The courtroom is on the second floor, along the longitudinal axis, and furthers the architectural symbolism of the exterior. The elevations are unified by the discipline of the Ionic portico, which imposes its order on all elements of each elevation. Heraldic devices and tabernacle frames embellish the façade. The portico is executed in stone. Four massive, unfluted Ionic columns with pilaster responds feature Scamozzi Ionic capitals with festoons suspended from the volutes. The columns support a major entablature, also executed in stone. 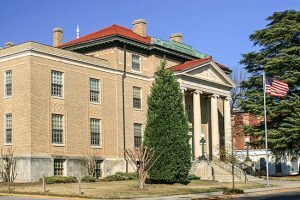 The portico is on a stone basement story, which girds the entire building. The walls are brick, with every sixth brick course recessed to simulate rustication. Listed in the National Register October 30, 1981. What exit off 95 is the courthouse, please. 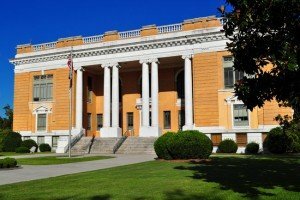 The Dillon County Courthouse is the most beautiful building in Dillon.